The city began to change and grow dramatically at the end of the 19th century. It spread tentatively beyond the city walls when Moses Montefiore built Mishkenot Shaananim in the late 1860s. This was an important step in Jerusalem history, for when the cramped population saw the success of the first few neighborhoods outside the city walls, more people were willing to venture forth and build along Jaffa Road. By the turn of the century, Jerusalem was well on its way to become a modern city. There were luxury hotels with hot, running water (the King David Hotel was the first), telephone lines and modern hospitals. But some areas of the city still remained unchanged and looked as they had done a hundred years before. 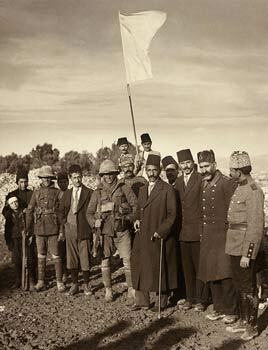 The year 1917 was another landmark in the history of Jerusalem: the Turks surrendered to the British (flying in lieu of a white flag, a white bed sheet borrowed for the occasion from the American Colony) and Jerusalem became a British-occupied city. Mandatory Palestine marked a new era that heralded the Arab-Israeli war and the dawning of the modern State of Israel. The following footage shows Jerusalem in 1918 – one year after the arrival of the British. Some of the images, however, date from the period of Turkish rule a few years prior. The last few seconds of the video will also give you a rare glimpse of Rachel's tomb, the way it used to look. This is a fascinating look in time and it’s very interesting to see how different some things were – and what has never changed.